Our service portfolio covers all the fundamental aspects of Information Technology infrastructure support as required by most organisations today. Refer the hyperlinks in the left sidebar for more information on these services. 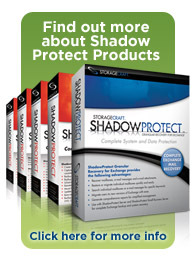 ShadowProtect - simple, powerful backup. Restore a server in 3 - 5 minutes with VirtualBoot (TM) technology. Learn why we love it.